Browsing through bookstores is one of the best things to do when travelling. The scent of both old and new books can make me so happy. And I love finding a new, quirky bookstore when visiting new destinations. 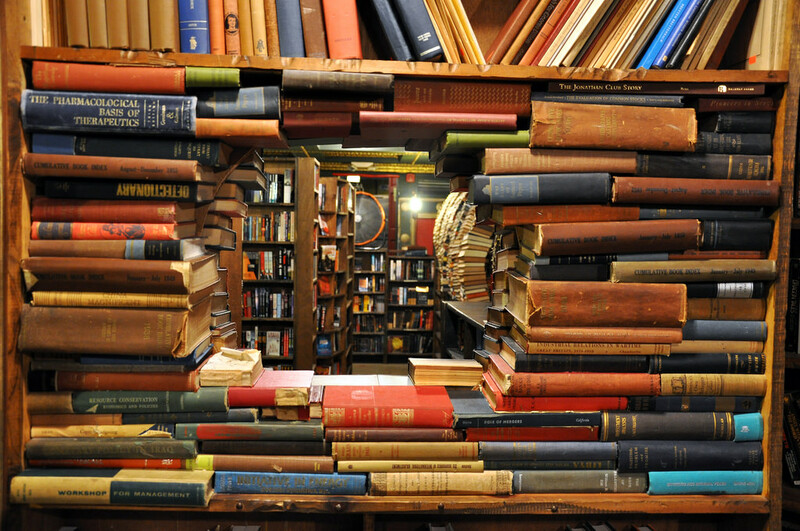 Discovering a new book or author when going through bookshelves or finding your favourite book in a new edition. 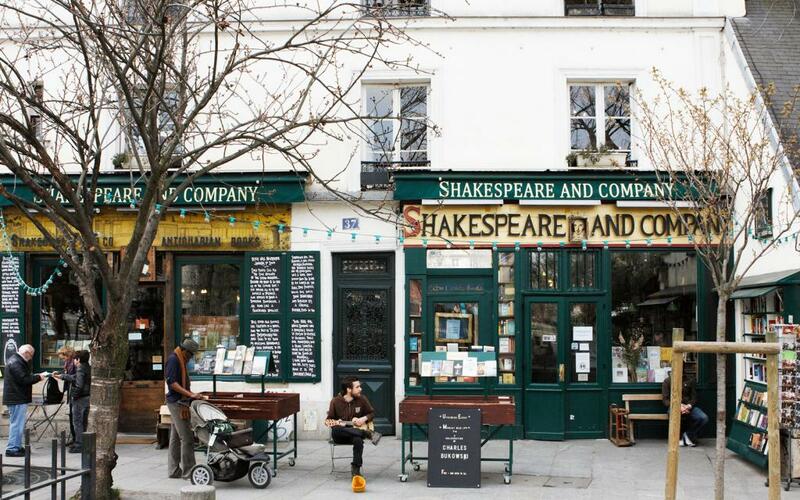 And I love that places like these exist in times of e-books and online shopping. These are some of my own go to bookstores and a couple of new ones I want to visit. This is one of the classics and has been around for almost a hundred years at a couple of venues on the left bank. The first venue was visited by greats such as my own favourites Ernest Hemingway, F. Scott Fitzgerald and Gertrude Steine. The English-language bookstore has ever since, despite location, attracted both great authors and bibliophiles from around the world. The small bookstore has now opened a coffee shop next door, where you can drink coffee while listening to international authors discussing their books. 37 rue de la Bücherie, Paris. On my visits to New York, I always come here and spend an hour or more going through their recommendations. I always find something new to read and bring home with me. Their combination of both old, new and rare books is the best and they always spot great young authors. Make sure to keep an eye out for their events on the website, as you might just get to meet one of your own favourite writers in the bookstore. 828 Broadway, New York. I have written about this bookshop before in my guide to Downtown Los Angeles. And it is really worth the trip to Downtown LA if you are in the area. 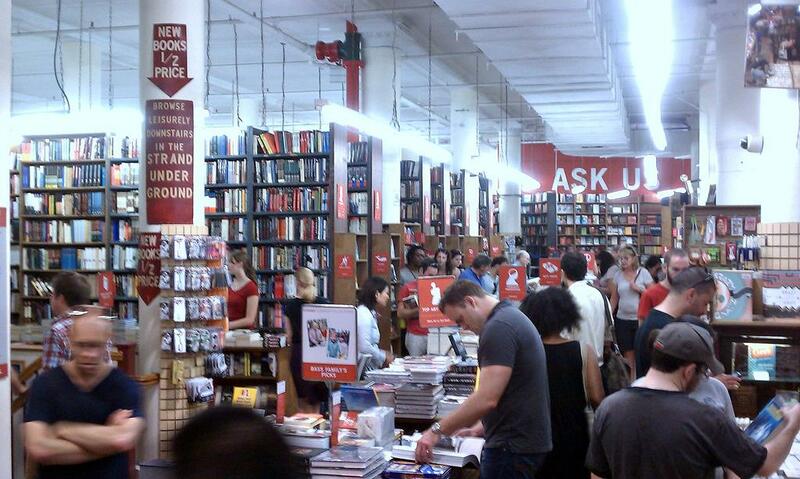 It is the biggest in Los Angeles and you will be scouring through both old and new books. 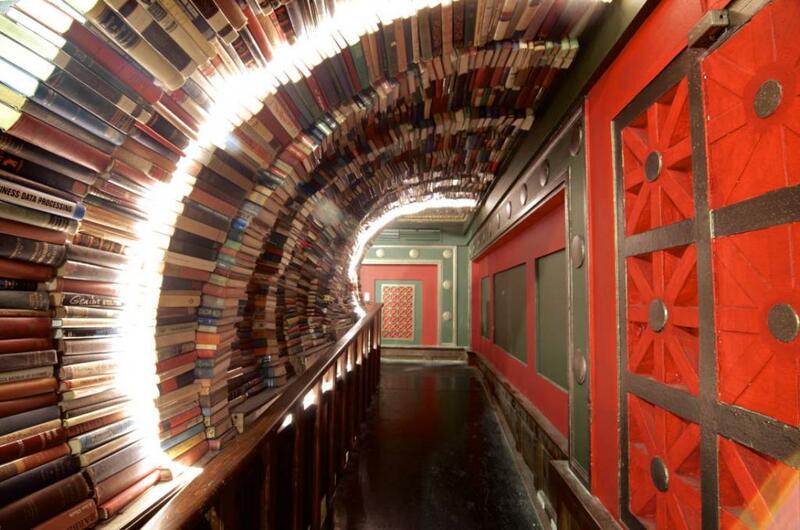 The store is literally a labyrinth of books, tunnels made of books. Be sure to watch the short and very inspirational documentary about the owner of The Last Bookstore, Josh Spencer, below. 453 S Spring Street, Los Angeles. 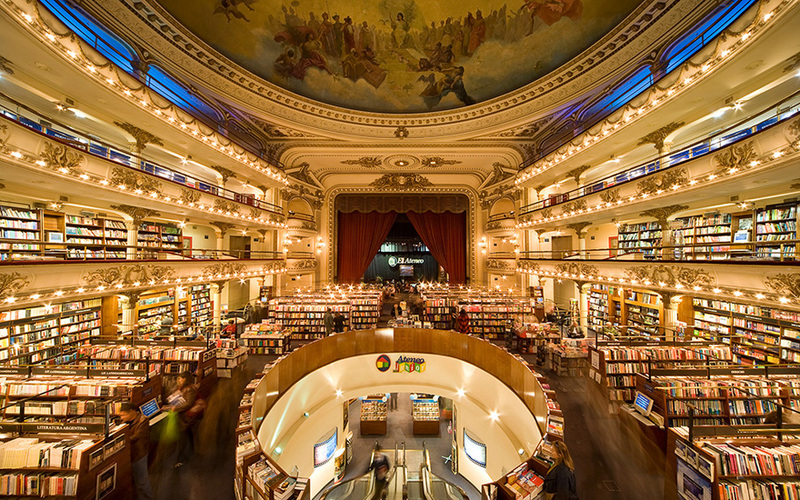 I have always wanted to go to Buenos Aires and this bookshop only makes me want to go even more. Located in what has been both an old tango theatre and a cinema and the impressive room is both grand and splendid. On the old stage behind heay red curtains, a café will serve you a perfectly made Argentinian cup of coffee. Av. Santa Fe 1860, Buenos Aires. Shopping for books in an old Gothic church from 1294 sounds quite enticing. High ceilings with beautiful medieval frescos, grand stone pillars, alcoves for reading and the bookstore also features a café. 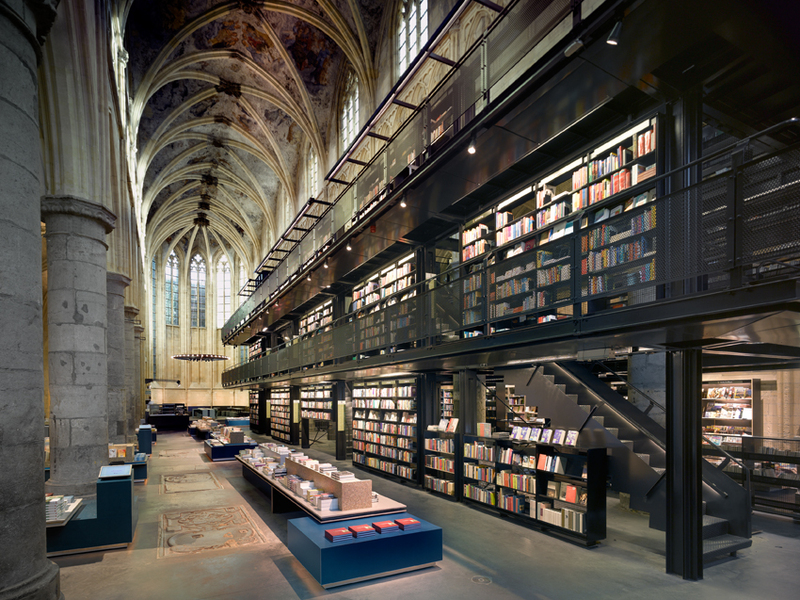 The Dutch church has not housed religious services since 1794 and is now home to one of the coolest bookstores in the world. The modern décor of the bookstore fits perfectly with the Gothic architecture of the church. Dominicanerkerkstraat 1, Maastricht.